Pictured is the latest rendering of the proposed hotel that, if approved, would be built on Spring Street in Delaware. The proposed location is directly behind Ohio Wesleyan University’s Richard M. Ross Art Museum. Conversations between the City of Delaware Historic Preservation Committee (HPC) and developers continued Wednesday over a proposed hotel that would be constructed on the north side of Spring Street, directly behind the Ohio Wesleyan University’s Richard M. Ross Art Museum. 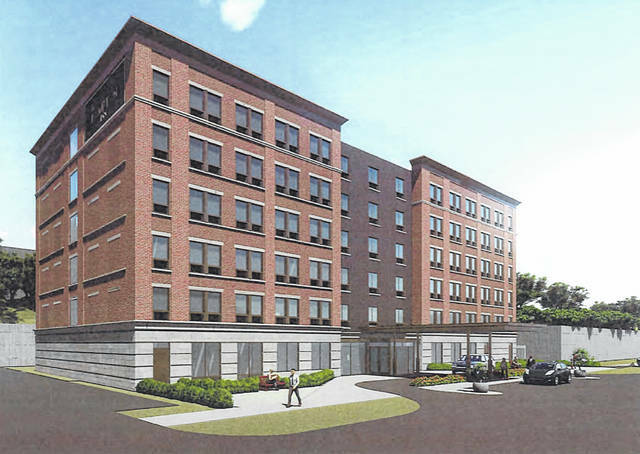 Prior to Wednesday’s HPC meeting, the two sides met for the first time last month to begin informal discussions on a proposed six-story Hampton Inn. Under the proposal, the current buildings — a former auto repair shop and current NAPA auto parts store — would be demolished to make way for the hotel, which would include approximately 118 rooms. Parking for the hotel would include both existing street parking spaces as well as the addition of two proposed lots on the opposite side of Spring Street. At the initial meeting last month, HPC had concerns on how the concept of the building would fit in with the surrounding buildings in the downtown core. “In looking at all the different factors, there are certain things that obviously jump out as things that are very clearly not in compliance with the standards for the transitional subdistrict,” Commissioner Erinn Nicley said at last month’s meeting. Originally, Indus Hotels presented a white brick building, but HPC recommended something red that would be more fitting for the downtown core. The developers came back Wednesday with a rendering that featured Madison Blend brick, which has the reddish look HPC is looking for. In addition to the change in color, the developers also presented two different looks — brick or metal — for the middle section of the building, above the entrance. Every commissioner agreed brick would be more appropriate, with Nicley saying he wasn’t aware of another building in the downtown core that featured vertical metal materials. The overall size of the building, at approximately 70 feet tall, was also a concern. In their new proposal, the developers included various horizontal designs that would help break up the overall scale of the building. Indus Hotels will come back to HPC for a final presentation at next month’s meeting, where it hopes to obtain a certificate of appropriateness from the commissioners. Following the final meeting with the HPC, the proposal would head to the Delaware Planning Commission.